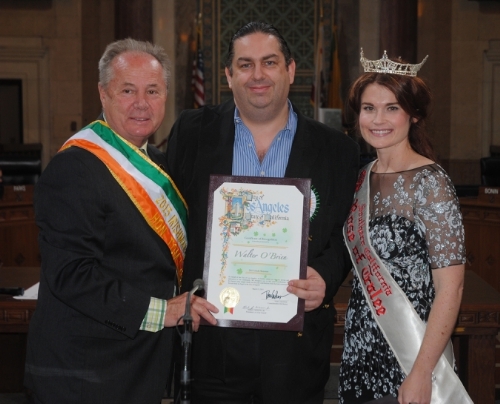 LOS ANGELES, Aug. 17, 2015 /PRNewswire/ -- Walter O'Brien, the founder and CEO of Scorpion Computer Services, Inc. and inspiration behind CBS' hit television show, Scorpion, was nominated "Irishman of the Year" 2015. President of the L.A. City Council, Herb Wesson, Jr., and Councilmember of the fourth district, Tom LaBonge, made the nomination. In recognition of O'Brien, Wesson and LaBonge wrote: "On behalf of the City of Los Angeles, we hereby salute you on your service and dedication to our community. We recognize you in this year's celebrations for St. Patrick's Day and we thank you for your contributions from the Irish community. You are truly an Angel in the City of Angels!" On receiving the nomination O'Brien said: "It's an honor to live in and serve the great City of Los Angeles. I'm also immensely grateful for the support I've received from Ireland." 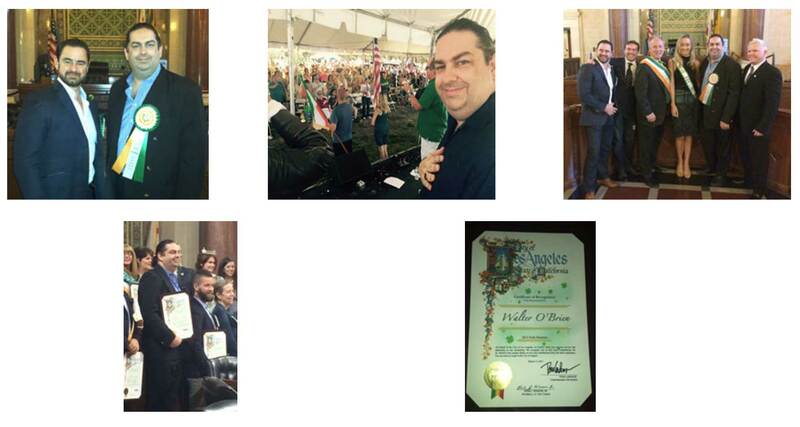 O'Brien also received a mayoral certificate from Mayor Andrew McGuinness of Kilkenny, Ireland to acknowledge his contribution and dedication to the Irish community in LA. McGuinness commended on 'the great pride' Mr. O'Brien brings to the city and thanked him for his continued support for TaxiWatch Kilkenny and suicide prevention services. O'Brien was a guest celebrity judge at BritWeek: Code for Kids Hack-A-Thon in Los Angeles. ConciergeUp.com, the public-facing arm of O'Brien's Scorpion Computer Services, has helped a number of people and businesses solve opportunities this year. Also in 2015, O'Brien launched Scorpion Studios, Inc., to serve motion picture studios. Walter O'Brien is the CEO of Scorpion Computer Services, CEO of Scorpion Studios, the founder of ConciergeUp.com, and the Executive Producer of Scorpion, the hit CBS-TV drama with over 26 million television viewers that is inspired by O'Brien's life. The U.S. Department of Homeland Security has certified Walter O'Brien as being a person of national interest to the United States and granted him an Extraordinary Ability EB 1-1 Visa. He has worked with the U.S. Department of Homeland Security, plus Navy and Air Force systems to employ his artificial intelligence systems to protect American military personnel. In addition, he has worked with multiple Fortune 500 companies including the world's largest mutual fund, Fujitsu, Trados, Oracle Corporation, Baltimore Technologies, and Critical Path. O'Brien currently serves as chairman or board member for Indi.com, Strike Force Solutions, Talentorum Alliance, and Lawloop. O'Brien regularly donates his time and talent to helping and educating smart charities and the community in general to encourage new generations to celebrate intelligence. Scorpion Computer Services is the internationally recognized problem-solving consultancy led by Walter O'Brien (AKA "Scorpion"). For over two decades, Scorpion Computer Services has contributed to the greater good by managing geniuses as they transform Scorpion client ideas into reality. From national security to rescuing failing businesses, Scorpion Computer Services acts as the brain power behind solving global issues, proving "smart is cool." Scorpion Computer Services also offers its services to the general public through ConciergeUp.com, a global think tank-for-hire that provides on-demand intelligence as a concierge service for any funded need.